Amish/Mennonite women allow their hair to grow long, pinning it up into a bun, and then covering it with a prayer covering. They follow the principles given in I Corinthians 11:5 & 6a "But every woman who prays or prophecies with her head uncovered dishonors her head, for that is one and the same as if her head were shaved. For if a woman is not covered, let her also be shorn...." and I Corinthians 5:15 "But if a woman has long hair, it is a glory to her; for her hair is given to her for a covering." They also believe the Bible teaches that distinctions should be made between the sexes, and the long hair is a sign of female distinction. Believing that an individual should always be prepared to pray, the prayer covering is worn at all times. SO WHAT DOES THAT HAVE TO DO WITH HAIRPINS? Amish/Mennonite women's long uncut hair (sometimes knee length) has produced a challenge to keep the hair neatly and tightly tucked under a prayer covering for the entire day as they go about their days work. Normal department store hairpins are not sturdy enought to hold a headful of hair for an entire day. They also bend easily and loose their shape with minimal use. A Lancaster Amish Man seeing the need to produce a hairpin that would meet the needs of his communities Amish/Mennonite women's long hairstyles, began manufactering these heavy duty hairpins, that have pointed but slightly rounded ends. The Stainless Steel Hairpins will keep any active woman's hair neatly tucked in place all day long! Personally having waist length hair swept up at the base of my neck, I have not found any other hairpin that comes close to being able to keep my hair nice and tight all day long! These hairpins will NOT BEND & TWIST like the ones found in your local stores! 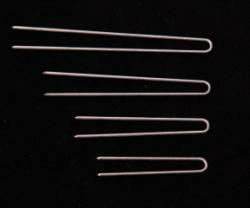 For thick waist length or longer hair we recommend the 3" pins. The 2 1/2", 2", or 1 5/8" will work nicely with thinner or shorter hair styles. These hairpins will go in your hair smoothly and pull out smoothly! NO cutting hair and splitting ends just to remove your hairpin at the end of the day! NEVER go back to using the cheap drugstore variety! Well worth the extra money for hairpins that last years! 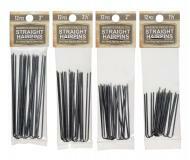 I have hip length hair, these are the best hairpins I have ever used! Great for my thick hair! My daughter is a dancer and has very thick hair. These are the only type of pins that will keep her hair in a bun. These pins changed my life for my thick hair! Far superior to any others I've tried, strong, don't bend & hold all day!